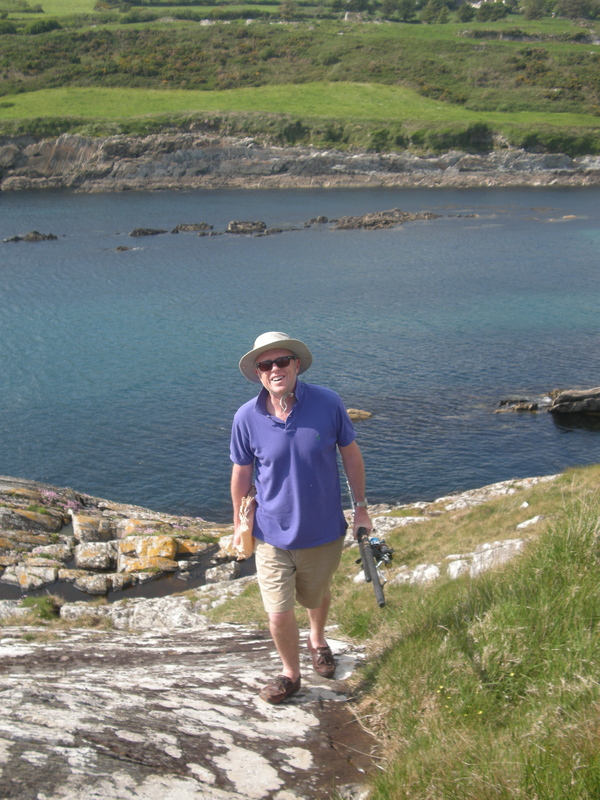 Journalist, award-winning writer and good life enthusiast on secondment to the rural southwest coast of Ireland. This time it’s all about what I like to eat and drink and cook…but mostly eating…I like to eat. Please stop by at eatinginc.wordpress.com and let me know what you think. As you are no doubt aware, ‘Eating the Sheep’s Head’ has been very quiet for a long time now. 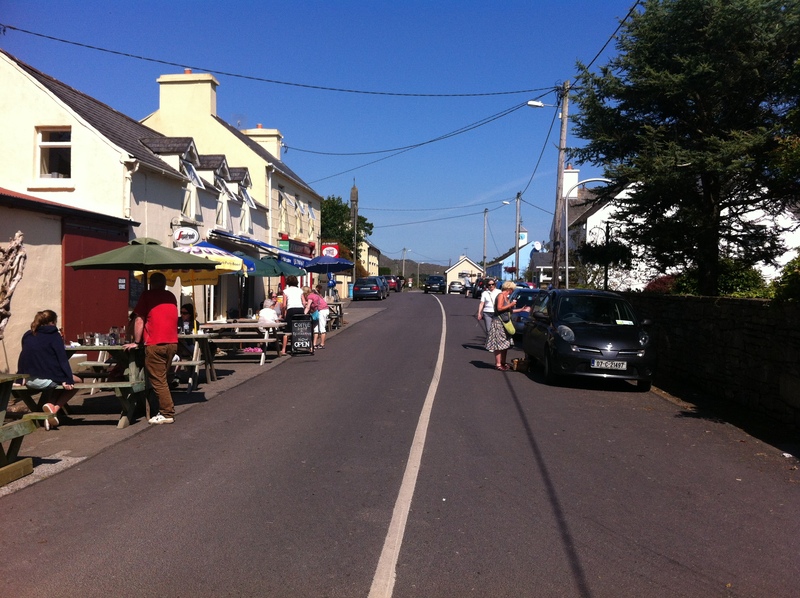 My wife and I are no longer living in Kilcrohane but have moved a few miles down the road to the gateway to the peninsula, Durrus village. With the move, my life has headed off in another direction and a new adventure has begun. What’s that you say? A new blog? Last year (2013), I submitted some of my work at the West Cork Literary Festival and was lucky enough to receive the J.G. Farrell Fiction Award for a novel-in-progress. 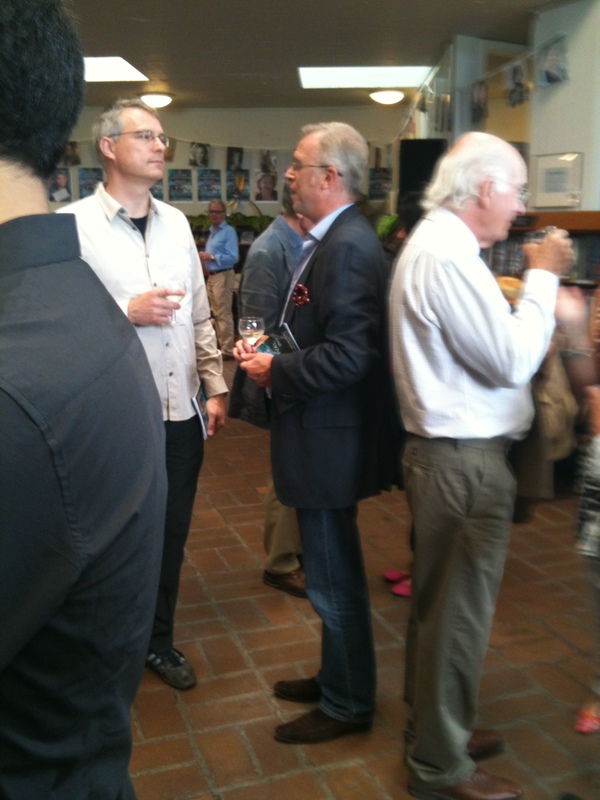 With Richard Skinner from Faber Academy at the West Cork Literary Festival in 2013. So, I have spent the last year researching and working hard to write my first novel, which is set in the eastern states of the USA. I will be spending two months following my story through the American states stretching from New York to Pennsylvania down to Virginia, North and South Carolina and then back up through the Shenandoah Valley to Lancaster, Pennsylvania. I have started a new blog entitled ‘Travels with a Confederate‘ and I hope you will take a look at it and perhaps follow my adventures in the USA. I have never been to America before so I am documenting my travels: the sights, food, people as well as the stories I pick up along the way about the people I meet and the places I visit. I hope you come along with me as I make my way on my American adventure. 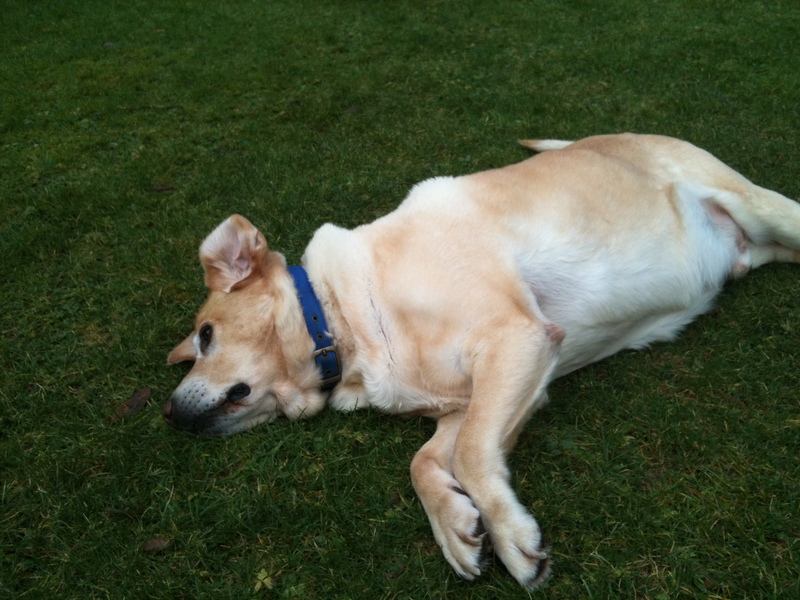 Today we heard the sad news that a Kilcrohane legend has past away. 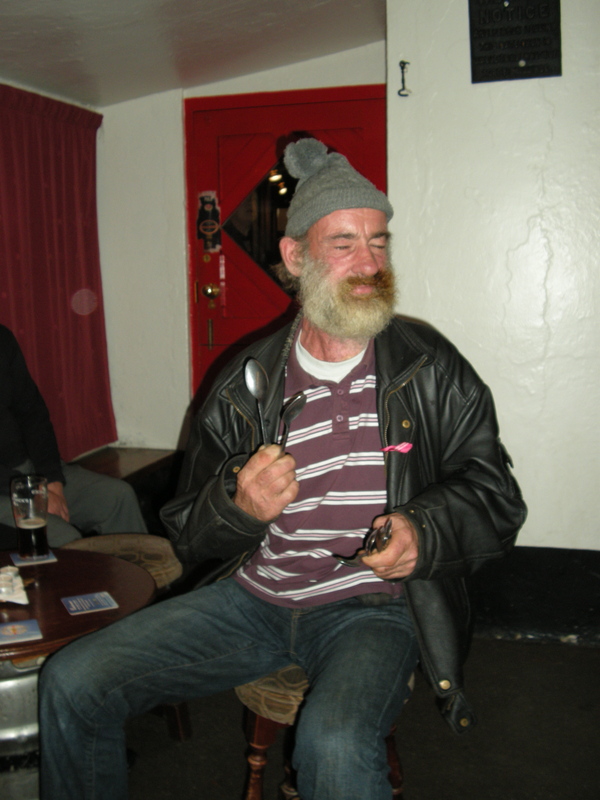 This is the first blog where I mention Finbarr, if you scroll down you will find a recording I made of Finbarr playing the spoons to what I think was his favouriate song ‘Galway Girl’ with Neil Lynch in Eileen’s Bar. 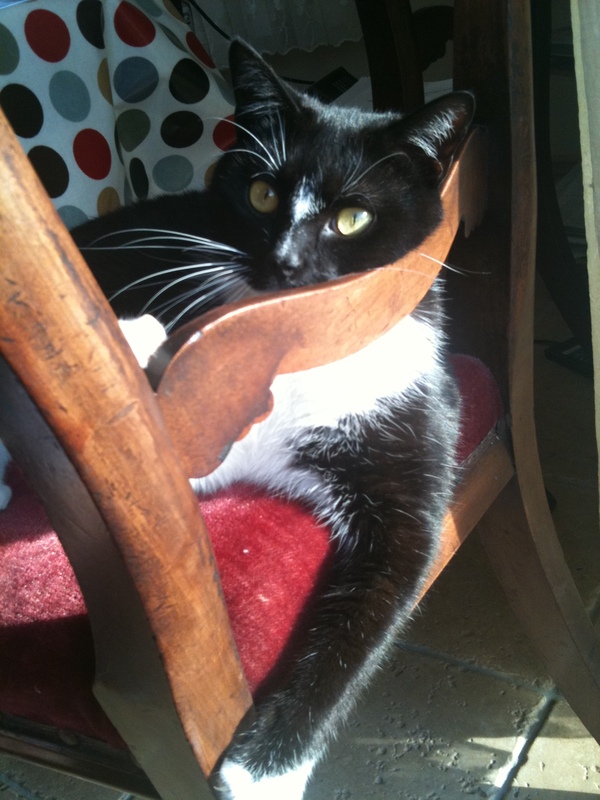 Would you like a glass of sherry? I know what you’re thinking, drawing rooms, cardigans, slippers, perhaps a pipe stand, and a decanter (if you’re posh) filled with a brownish, sticky, sweet liquid and a small glass to sip from. And what was a Sherry Reception exactly? The same brownish, sticky, sweet liquid and a small glass to sip from while your country cousins began to remove their ties and jackets, roll up their sleeves, down a few pints of stout and prepare for the main event – the ‘dinner’. I remember seeing rows of sherry glasses, sitting filled and abandoned on a long table as all but one or two of the wedding guests made a beeline for the bar and the ‘proper drinks’ while we awaited the arrival of the bride and groom. So, if your thoughts turn to maiden aunts, rural weddings or a brownish, sticky, sweet liquid and a small glass to sip from, then I am here today to tell you that Sherry, Real Sherry, is a revelation. I am also here to tell you that I am a sherry lover and I have come to this astounding conclusion not on the road to Cádiz but on the road to Ballylickey in West Cork. First let me set the scene. You will be aware, I am certain, that West Cork has a reputation both at home and abroad, for good locally produced food. 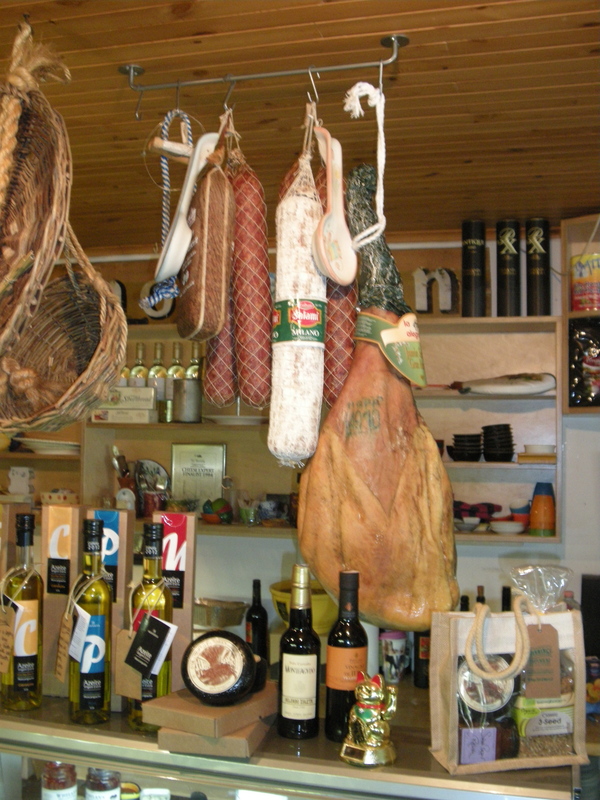 Cheese, meat, seafood, you name it, there is someone in West Cork using said local produce and making delicious food. 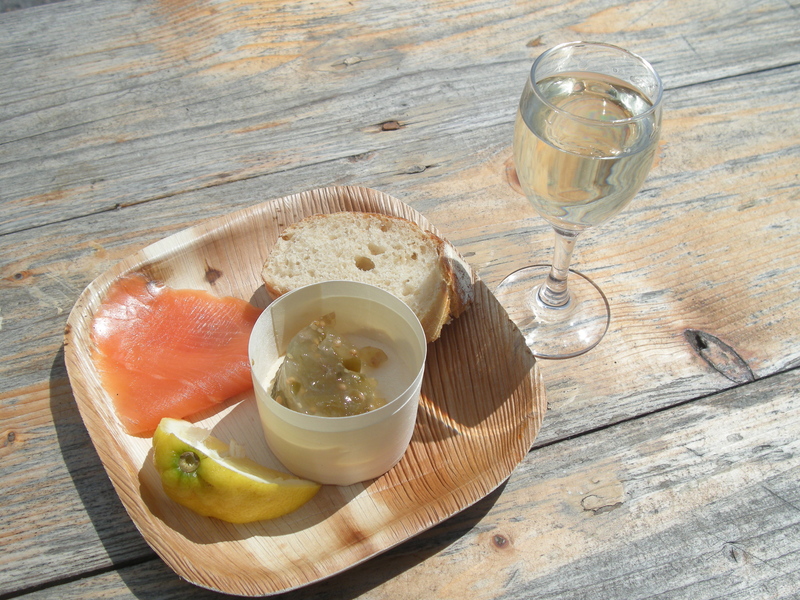 While these producers are spread from the rugged coastline to the beautiful mountains, there is an oasis where you can go and not only enjoy a plate full of local cheeses, or fill your basket with locally reared meats, smoked salmon, or freshly baked breads and cakes, but you can also have a glass (or two) of specially selected wines from some of the best French, Spanish or Italian vineyards. 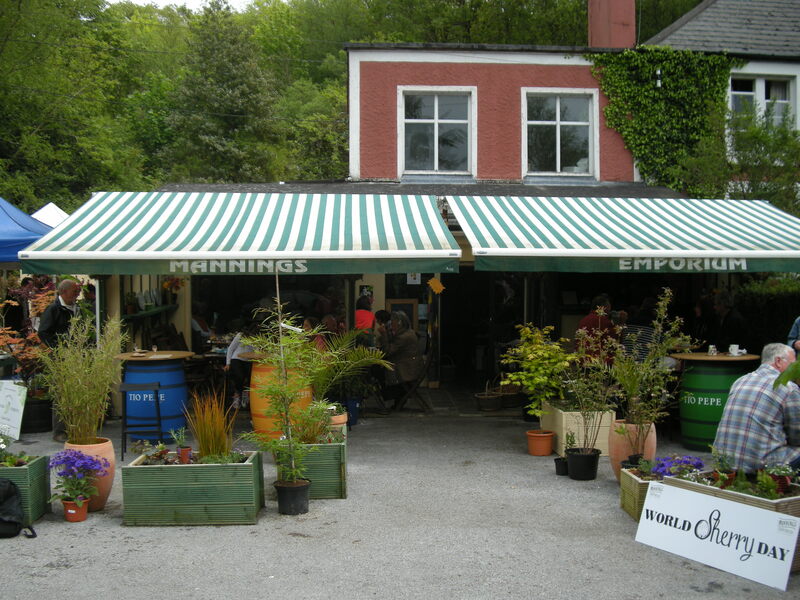 You can find all this on the shores of Bantry Bay at the renowned Manning’s Emporium in Ballylickey. 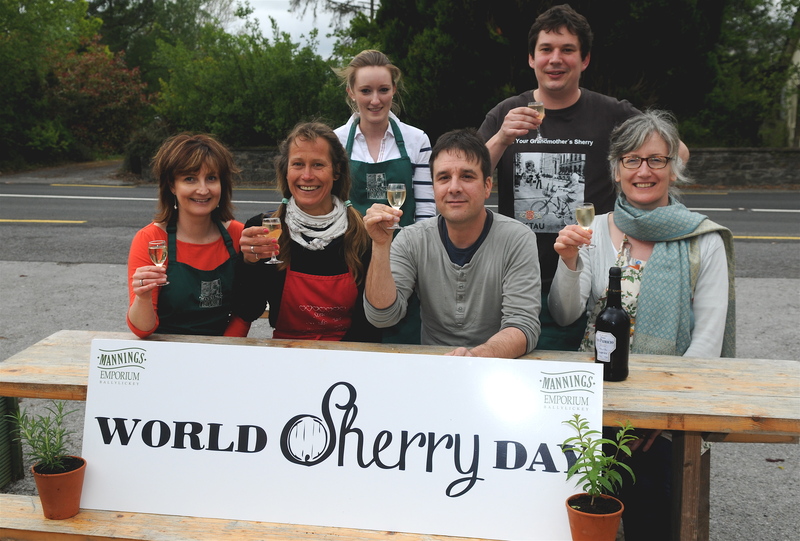 And it was at Manning’s that we recently celebrated World Sherry Day 2013. This worldwide event is held to celebrate fine sherry and good food and it was only right and proper that Andrew, Laura, Val and the team at Manning’s represent West Cork on World Sherry Day or ‘WSD’ as we hip, cool, sherry aficionados say. Of course, there is no point in going to an event such as WSD and sitting on the sidelines. I decided to immerse myself (not literally, well, almost) in the sherry on offer. Somebody had to, in the interest of accurate reporting you understand. 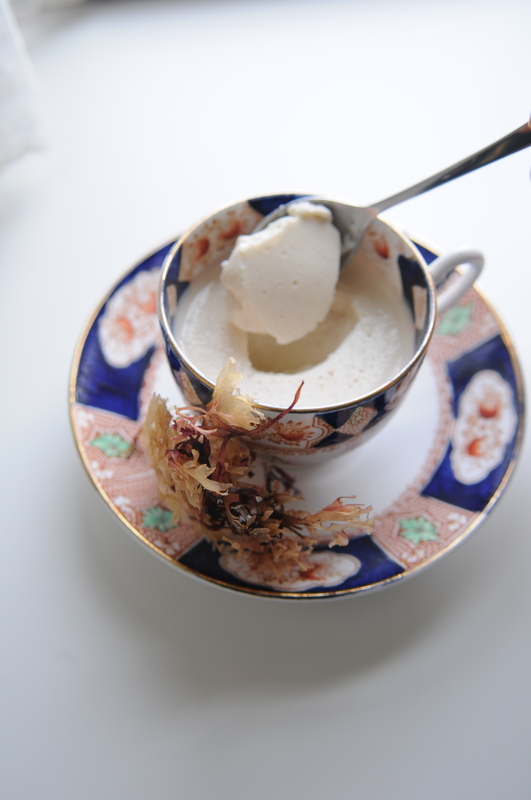 I began with a sherry that was served ice-cold, was bone dry and full of flavour. This was an immediate shock to my system as I had prepared myself for a warm, sweet liquid. Another shock was that this particular sherry has an Irish connection. There seems to be two stories as to how a Waterford man ended up in Spain making sherry in the latter part of the 18th century. The first one goes something like this. William Garvey left Waterford in 1780 on his way to Rome. As his ship sailed into the Mediterranean, a sudden storm off the coast of Spain led to Mr. Garvey’s trip to Rome being interrupted when the ship sank and the survivors found themselves ship wrecked not far from Cádiz. Not one to miss an opportunity, Mr. Garvey took one look at the vineyards in the area, the beautiful Spanish ladies, and the fact that half the country wasn’t under water for most of the year and decided, ‘To hell with Rome, I’m staying here’. And that’s exactly what he did. He married one of the beautiful Spanish ladies and started shipping sherry to London under his own label ‘Fino San Patricio’ or St. Patrick Sherry. 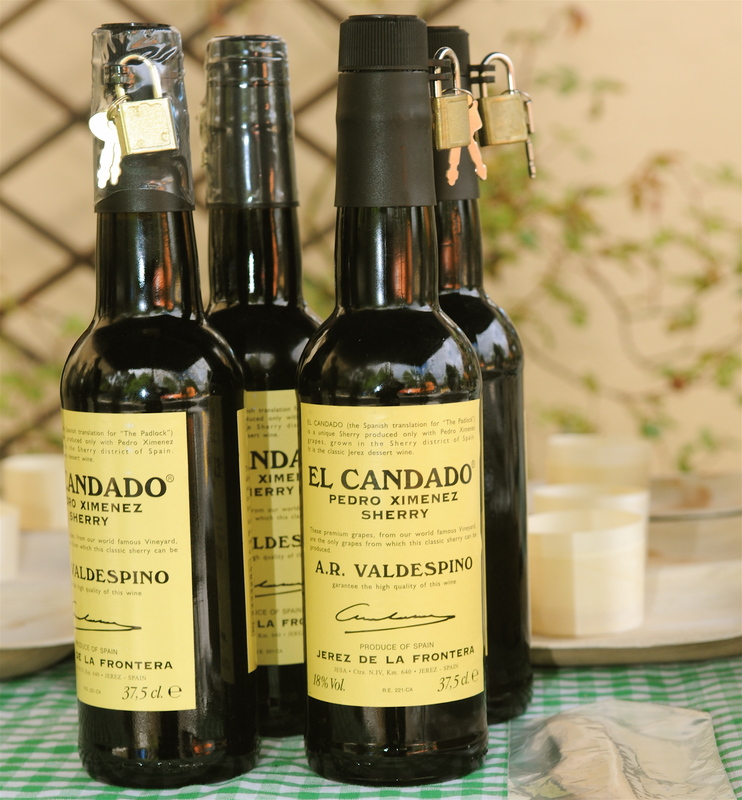 Now, over 200 years later, Bodega de San Patricio exports not only really good sherry but brandy as well. Then there’s the other story. This one tells of William Garvey leaving Waterford looking for sheep and finding sherry. I think I prefer the first one. Anyway, with the Fino San Patricio, we nibbled on locally produced Gubbeen Chorizo and some olives. Next, it was time to sample a Manzanilla. Again, this sherry was served ice-cold and while dry like the Garvey this sherry has a slight saline taste. The location of the vineyards and bodegas, along the coast to the town of Sanlúcar de Barrameda gives the sherry a real taste of the sea. We sipped this Manzanilla with some fantastic smoked salmon from Ummera Smokehouse just down the road in Timoleague. The smoky, oily salmon was perfect with the sherry. Now it was on to the next sherry and we were beginning to get a little closer, in looks at least, to the sherry of my childhood. However, this is where the comparison stopped. Served ‘à la’ red wine, the Amontillado is to taste not unlike a fruity, perhaps dry, cabernet. This sherry is a lovely, nut-brown colour and after the San Patricio is my favourite to match with food. 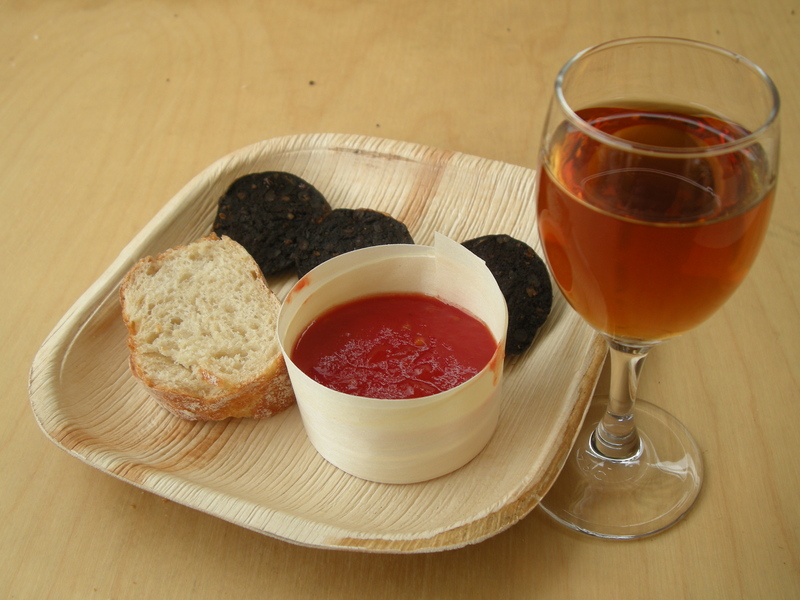 With the Amontillado, which was a match made in heaven, we sampled some spicy black pudding |(that’s blood pudding for all the vegetarians out there) from the wonderful Ballyvourney pudding makers. At this point I know what you’re all thinking. This is where he took a break, relaxed, had some water, maybe a little nap? However, I’m a professional and when I set out to report on a story or an event I never stop until the job is done. So, it was on to the next sherry. While things had become a little blurry at this point, the next sherry was a complete eye-opener, an Oloroso. Even darker than the Amontillado, this sherry was aged much longer in oak casks. It was amazing. Dark, rich, nutty, and I could be wrong but I got a distinct taste of butterscotch. This went perfectly with a selection of Gubbeen and Durrus cheeses. Sherry and meat, what more could you want? Cheese and Bread! There was one more sherry left to try. And this one came in a bottle with a lock and key attached. As dark as stout and with a consistency not unlike watery honey, this Pedro Ximenez is not for those who are without a sweet tooth. This sherry came with its very own handmade sherry truffle from master chocolatier Benoit Lorge and, in honour of WSD, an up-and-coming food producer (an incredibly good looking one as well) Caroline Crowley, crafted a Pedro Ximenez-infused carrageen moss pudding, using milk and seaweed. After the final sherry, as far as I remember, I called it a day. 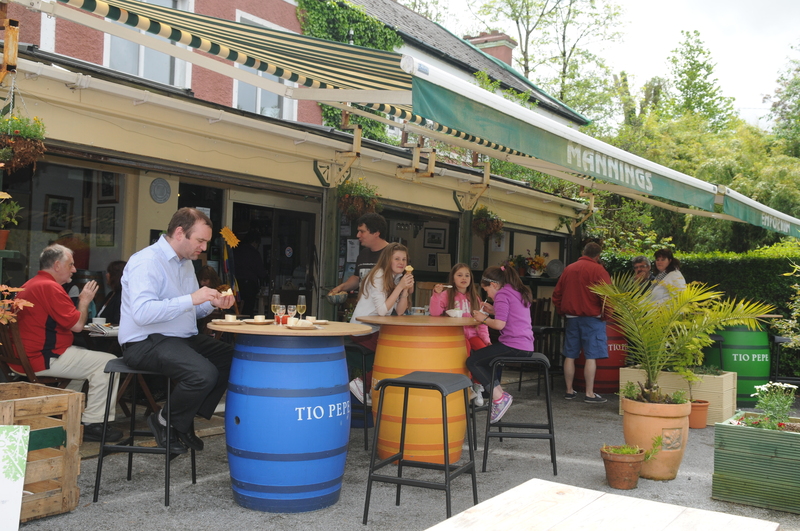 WSD was a wonderful event and I would recommend exploring the world of sherry and, for those planning a visit to West Cork, head for Manning’s before you go anywhere else. 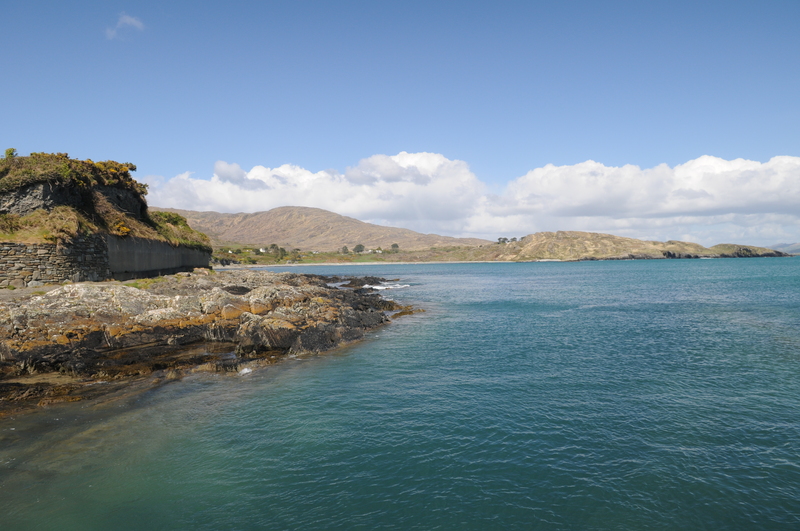 A trip here will set you up nicely for the rest of your West Cork adventure. 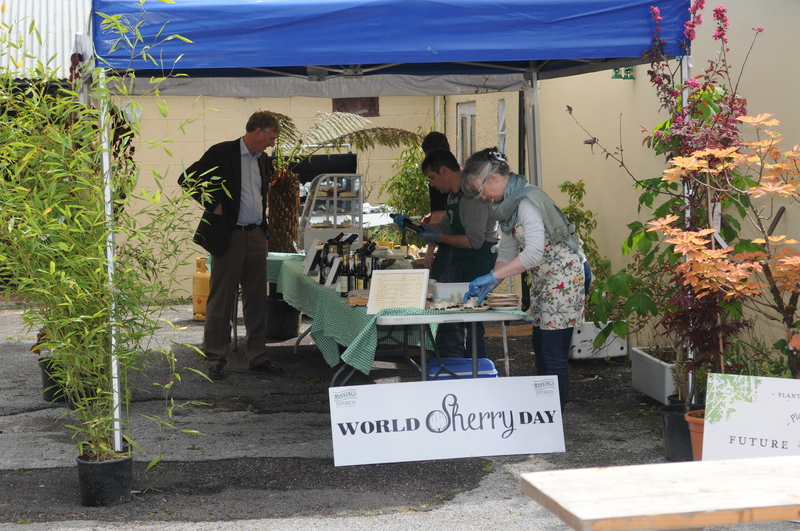 Looking forward to World Sherry Day 2014. Now does anyone know when World Whiskey Day is? Oh, how I long for those quiet days of yore. Back when I was just an everyday hack making his way in the world of news stories and features. Back when all I had to worry about were disgruntled politicians, annoyed parish priests, vengeful pork barons or the many, many chairpersons of local committees who didn’t like what I dared to write (or more to the point, who felt I hadn’t given them enough of a high profile in some piece I had published). I was able to walk the streets (at night) mostly unmolested, stand relatively unknown in the bus queue, and have a quiet drink in my local pub. Alas, it seems these days are over. I blame the Sheep’s Head Peninsula. All I had to do was settle in, enjoy the scenery, the food, the community, the weather (well, not the weather so much) and keep my mouth shut. But what did I do? I told the world about Kilcrohane, Ahakista, Durrus and Dunmanus Bay, not once but over and over and over again. I suppose it had to happen – looking back on it now it was only a matter of time. You see while I know that the blog has followers right across the globe, I never thought my ‘fans’ would come visiting. A spring day on the peninsula. And that’s just what happened a few weeks ago. There I was, minding my own business, settling into the new house in Durrus, getting used to my new office, when my sister-in-law arrives from Pennsylvania. Now, her visit was not unexpected, Marian runs a tour company called ‘Yanks Guide Ireland’ and we knew that she was bringing a group over to spend a week experiencing what Ireland has to offer. 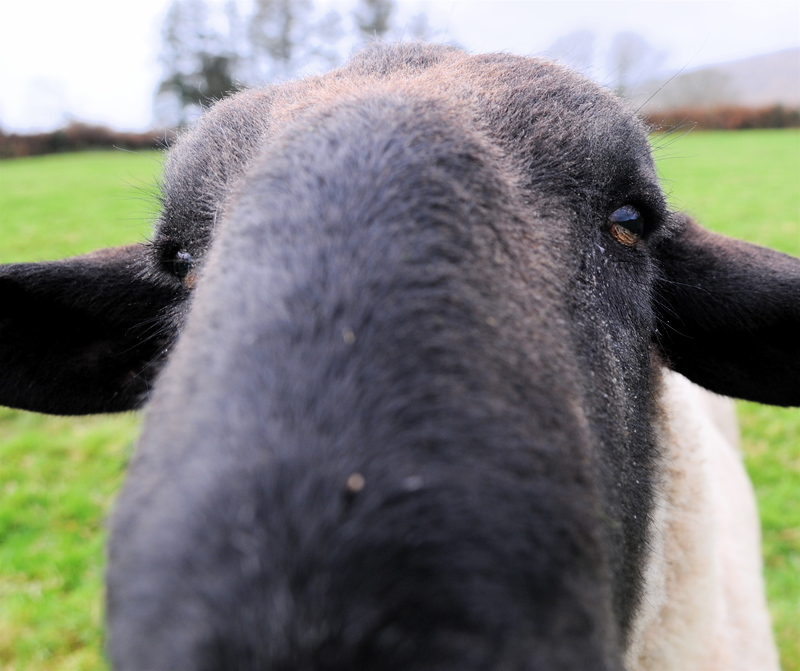 What was unexpected was that the tour consisted of fans of the blog who were very eager to visit the Sheep’s Head and experience all the wonders I should have kept to myself and…they wanted to meet me as well. So, for a couple of days my wife and I were treated like celebrities. Caroline cooked some Irish soda bread and some of her carrageen moss pudding and I was quizzed about places and subjects I had written about in the blog. It was all very flattering. 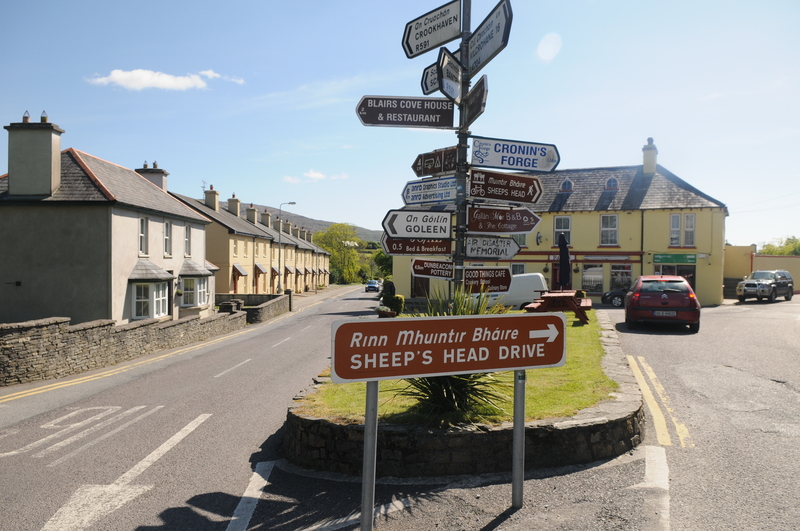 Although Dunmanus Bay, Eileen’s Pub, and Kilcrohane were all on the must-see list, food and especially food from the peninsula was, I was delighted to hear, high on the agenda for the Yanks who were now eating their own Sheep’s Head. 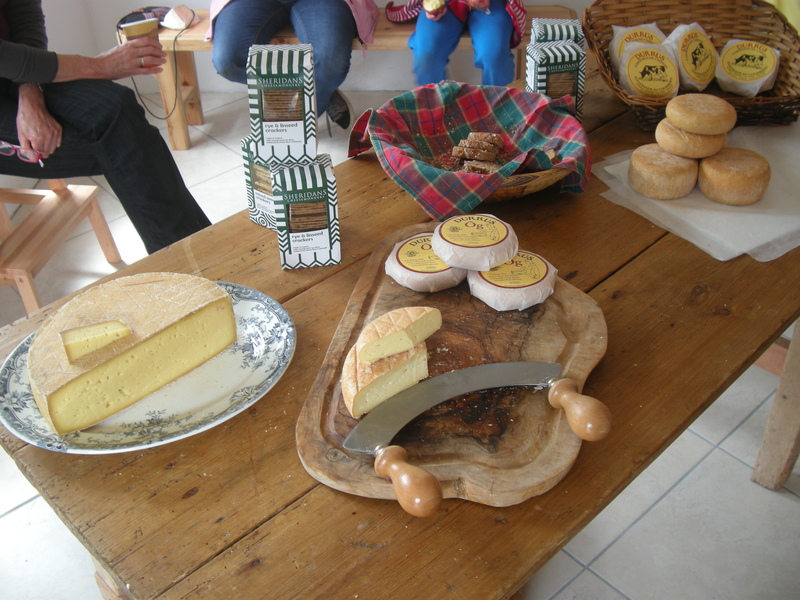 Of course, Good Things Café was top of the list but first a trip to meet Jeffa Gill at Durrus Cheese was called for. While there, the visitors, after tasting the wonderful cheese, decided to buy some to enjoy back in Pennsylvania. More about the plan to bring back artisan farmhouse cheese to America later but for now our visitors were relaxing into all that the peninsula has to offer. After a tour of Durrus Cheese, it was time for the group to head for Kilcrohane and Eileen’s pub. Now, I wasn’t on hand to witness what happened next but like all good reporters I have my local ‘sources’ who let me know exactly what occurred in Eileen’s. Eileen’s was as always very warm and inviting, the fire was crackling nicely, one or two locals were sitting at the bar enjoying a mid-afternoon drink when the yanks walked in. 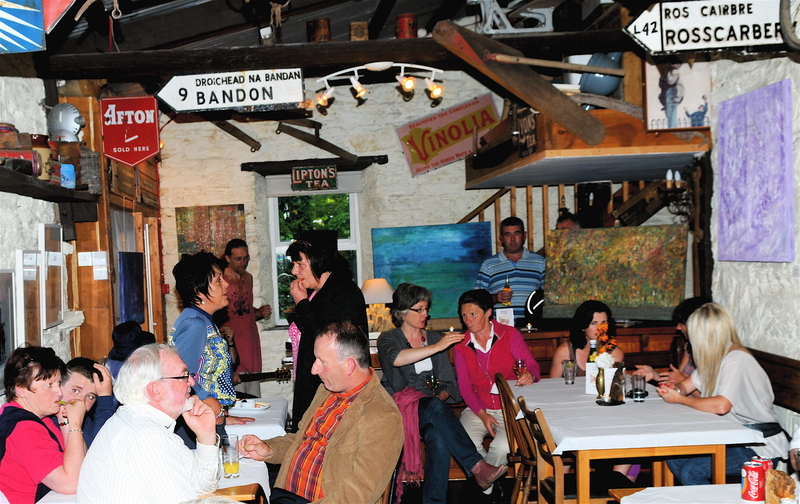 After the usual welcome, the drinks were served and the yanks relaxed and enjoyed the unique atmosphere of an Irish rural pub. Then, according to my reliable source, our visitors were called on to sing a song. 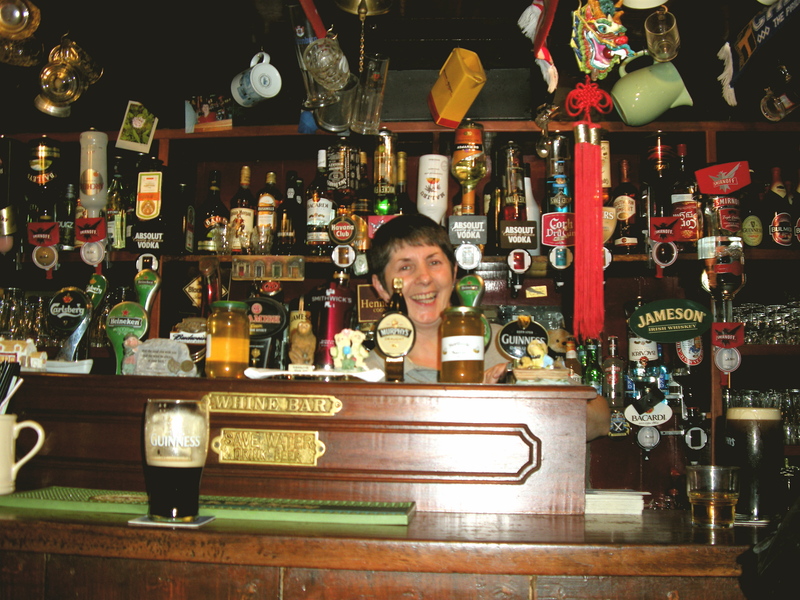 A common enough occurrence in an Irish pub you might think. And you would be right. However, it transpires that our guests’ choice of song left the locals a little bewildered. While the standard song choices on occasions such as this include lyrics of love and loss, hardship and revolution, famine and emigration, our American visitors decided that a round of ‘Row, row, row your boat’ was just what was needed. I believe ‘Row, row, row your boat’ has become a hit in Kilcrohane since. After the musical interlude in Eileen’s, it appears that a trip to Ahakista to sample some wine was in order. I suppose singing can make ones throat very dry. It was in Ahakista that the yanks met the wonderful Harro and Gisi. 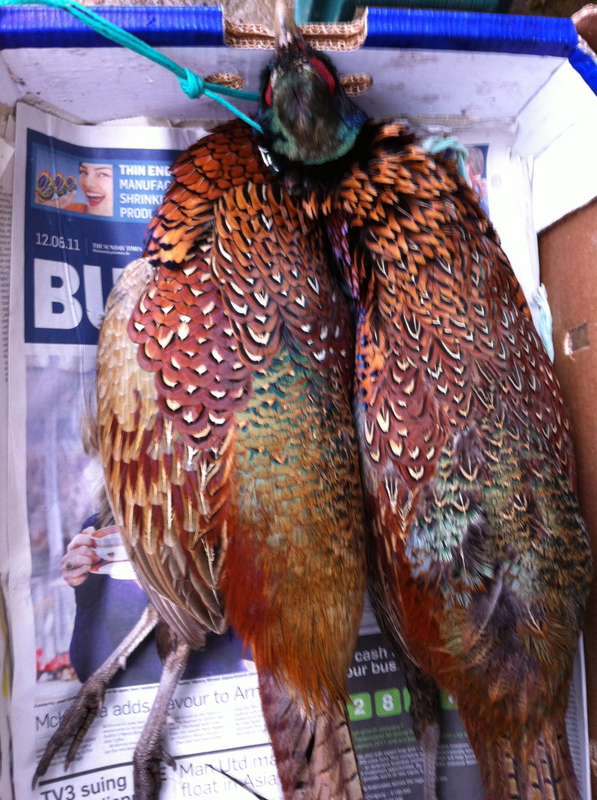 That is Harro and the fearless Gisi of the pheasant plucking event that left yours truly rather green about the gills. 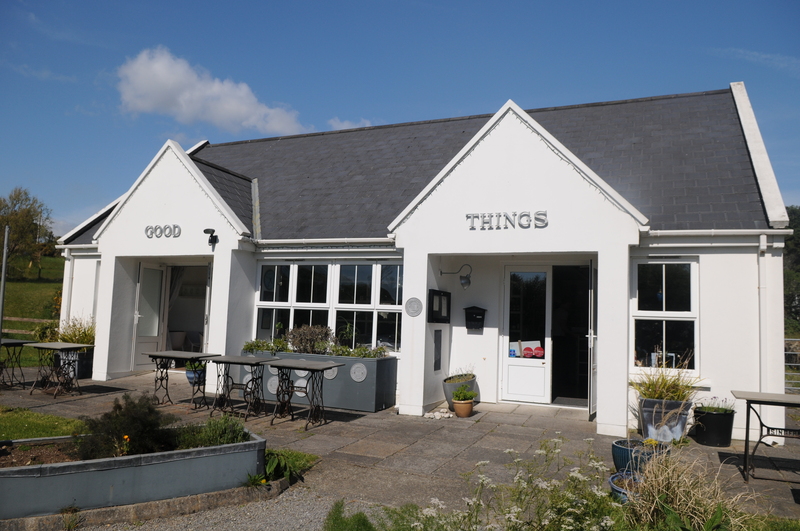 This time, it was not pheasants but wine that was on offer and after tasting one or two (or three) of the delicious wines in Harro’s wine shop the yanks returned to Durrus heavy with wheels of cheese and clinking with bottles of wine. 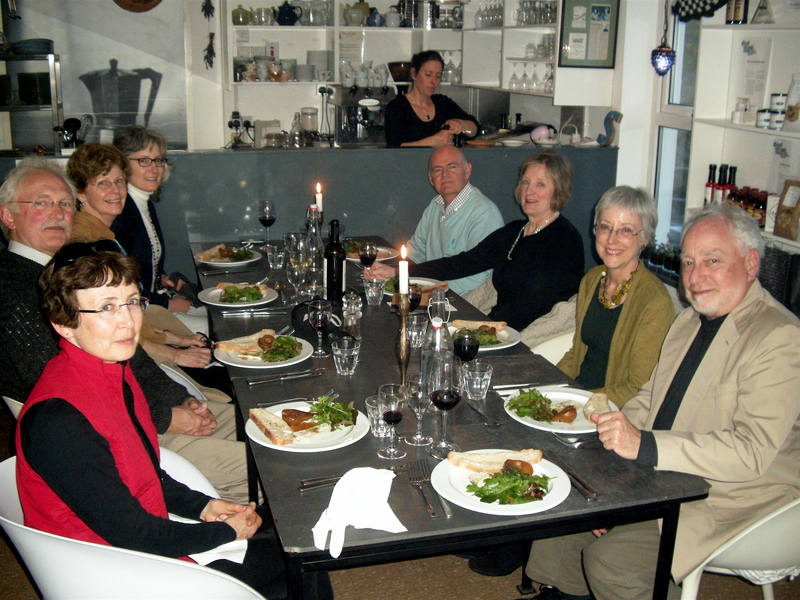 With the cheese and wine safely deposited at the accommodation, it was on to Good Things Café where Carmel had prepared a fantastic Friday night supper of blue cheese and roast pear, a choice of roast duck or a growers’ plate with local asparagus and, for dessert, a prune clafoutis. After all that good food, wine and convivial company, it was time to say goodbye to our American friends who were off to Dublin to soak up the atmosphere in the capital city before boarding the plane and heading back home to Pennsylvania. I know what you’re thinking, what happened to the cheese and wine? Did the yanks eat it all before they left the peninsula? Did they drink the wine before heading for Dublin? Surely they didn’t attempt to carry the cheese, Durrus Cheese, back to the USA in their luggage? Well, this reporter can now confirm that the Durrus Cheese, and we are not talking about a small amount here, made it back to the USA without incident thanks to a lot of luck and an old smuggling trick. Let me explain. For those of you yet to try Durrus Cheese (and you should), let me start by saying that for taste you’ll not find a better example of Irish artisan cheese on this small, wet island. However, like all good handmade cheese, Durrus has a very, shall we say, distinctive aroma. A small amount wrapped well would be no problem to transport in an airtight container, placed in a bag, tied well and then placed in another airtight container. But in this case we are talking about a large wheel of Dunmanus, a raw-milk semi-hard cheese, a couple of small Durrus Ógs, and a few wheels of the original Durrus Cheese. All of this travelling thousands of miles in luggage, not under refrigeration, through airport security? Good luck with that I thought, I could hear the latex gloves snapping already. Now if you love your cheese, like these yanks certainly do, you wouldn’t allow a small thing like a smell that could, given enough time and expertise, be weaponized, stop you from getting through a heavily guarded airport. So the wrapping of the cheese began. First in plastic bags, sealed tightly. So far so good. Then wrapped in another plastic, again sealed tightly. I know what you’re thinking: a hot, cheap hotel room in Bogotá, a bare light bulb above the bed on which is arranged packages wrapped tightly, all awaiting the arrival of some poor unsuspecting ‘mule’ to smuggle the illegal contraband out of the country. It was by all accounts, so my well-placed source tells me, very similar, apart from the bare light bulb and the fact that there is no way the yanks could swallow a wheel of Durrus Cheese. So another method was devised. And if you ask me, somebody knew far too much about smuggling contraband for the next part of the plan to be just a lucky ‘hunch’. With the cheese now wrapped in plastic, it was then put into another bigger bag that had a large amount of coffee and, get this, charcoal powder loosely sprinkled inside it. This bag was then sealed and the packages placed evenly throughout everybody’s luggage. The smugglers meeting in Good Things Café. I watched the international news feed with a sense of fear and excitement. I imagined the headlines on Fox News ‘A group of Americans returning from Europe have been caught attempting to smuggle a large amount of a yet unknown substance into New York. Experts at the FBI bio-terrorism section have advised residents in the area to stay indoors and close all their windows’. So we waited and then after some time with no mention of a huge smuggling ring apprehended at JFK, I assumed that the dastardly plan had worked. It had, and very well too it seems. There were no calls to the FBI, CIA, NSA or the White House. No citywide evacuation, no strip searches, no latex gloves, nothing. Nothing lasts forever. All good things come to an end. One door closes and another one opens. The glass is half full not half empty and so on. The Summer of 2012 and the beginning of a perfect day in Kilcrohane. These are the comforting words I have been telling myself over the last few weeks as we prepare to leave Kilcrohane for our new home just down the road, at the gateway to the Sheep’s Head Peninsula, in the village of Durrus. Our year on the Peninsula has past so quickly that as I sit here looking out the window at Dunmanus Bay glistening in the February sunshine, it feels like we have just arrived and unpacked. I will miss Kilcrohane. Part of me doesn’t want to leave, this is a very special place and I have been very lucky to be able to live, even if only for a short time, in such a wonderful community. Those of you who have been reading my scribblings over the last year will know all about the beauty of this very special part of West Cork. We have enjoyed adventures both on land and at sea, we’ve met artists, musicians, chefs, farmers, fishermen, sailors and of course the locals who make this place so inviting. We’ve had friends from the city who stayed for weekends and went home jealous (though they’d never admit it) and determined to come back. There were days when the rain just didn’t stop, and the south-westerly gales had us wondering if the house would still have a roof by the end of it all, but then there were the days, just a few, when we were in the right place at the right time. When the sun turned the Peninsula into a lush green finger of land jutting out into the blue and white of the Atlantic Ocean. 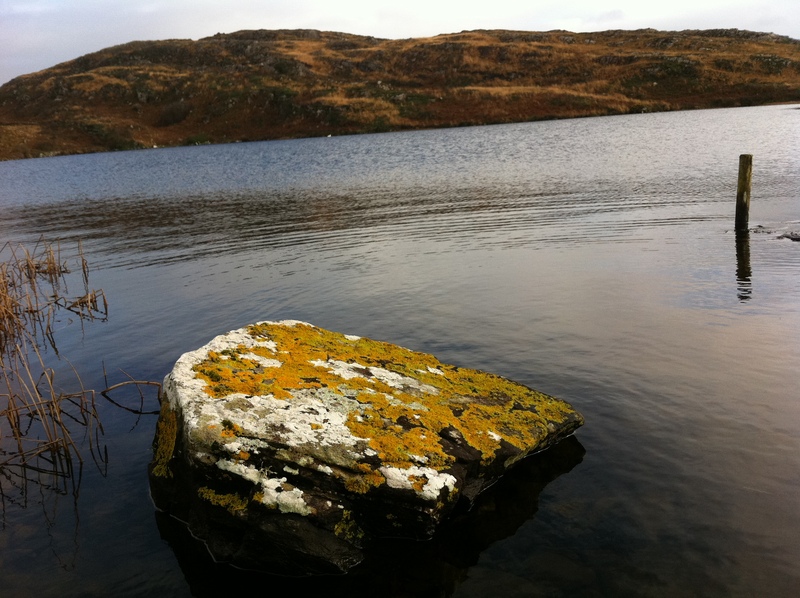 The days when you could sit on a rock and watch the gannets diving into Dunmanus Bay, or the seals basking on the rocks, or the otters fishing for sea urchins. Those few days when all seemed right with the world, when walking along the Funeral Path or the Fisherman’s Walk you knew that it didn’t get much better than this. 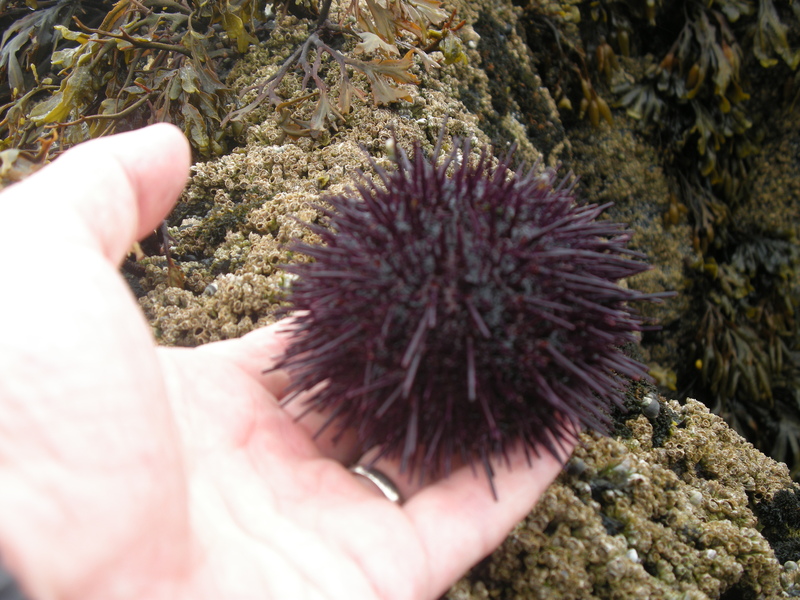 Sea urchins, spiney but delicious? 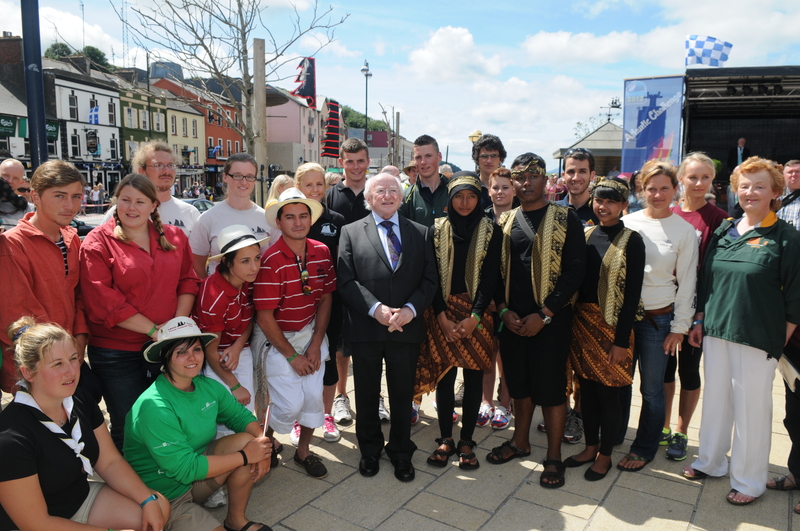 I particularly loved meeting the people who arrived during the summer for their annual vacation. Standing on Kilcrohane pier watching the sun set over the Peninsula, their children tired and happy after a day spent swimming, fishing from crabs or messing about in boats, standing there we would nod a knowing hello before the usual conversation would begin. ‘Isn’t it great here,’ the tourist would say. 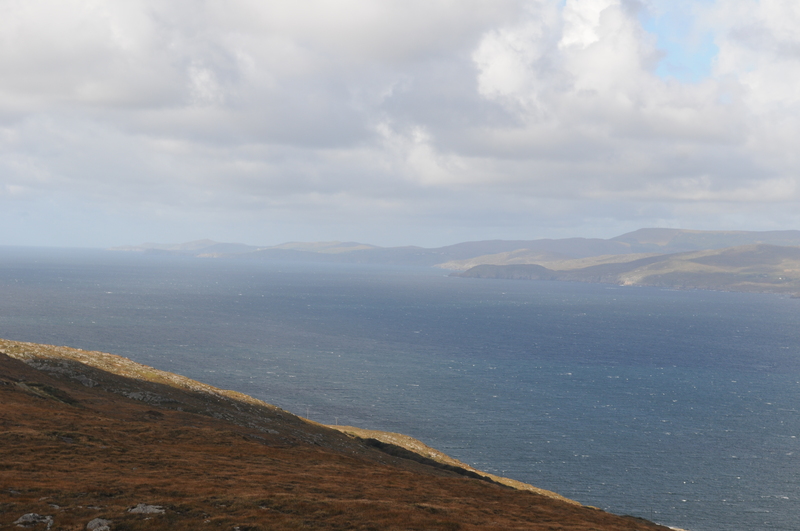 ‘Indeed it is,’ I would answer while we both looked out over the blue water towards the Mizen Peninsula. ‘You can’t beat West Cork, it’s a long journey from Dublin but it’s worth it just for this view alone,’ the tourist would continue. ‘Yes, it is lovely,’ I’d say smiling as I prepared myself for the next inevitable question. 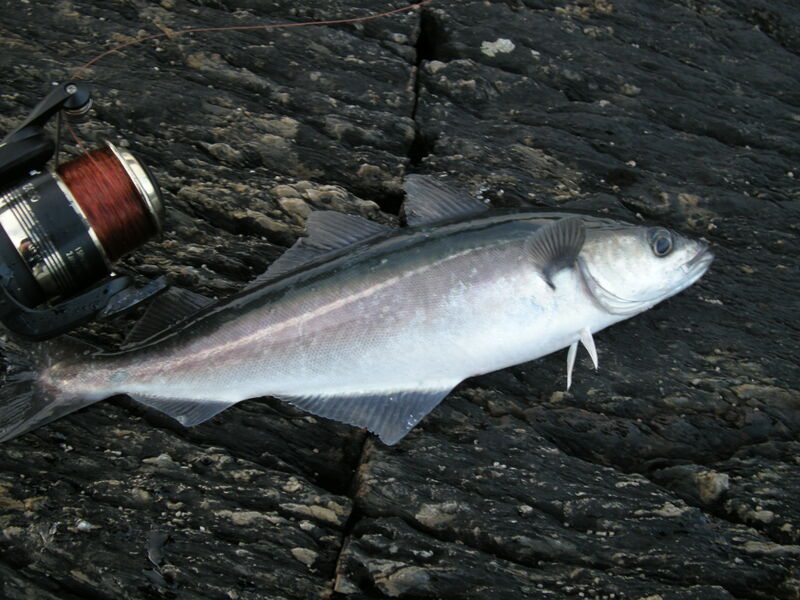 ‘Just a few fields away, I live here,’ I’d say, as I picked up my fishing rod and headed back home with one or two fresh pollock for dinner. This, I suppose, was cruel but I do enjoy saying I live in such a beautiful place. 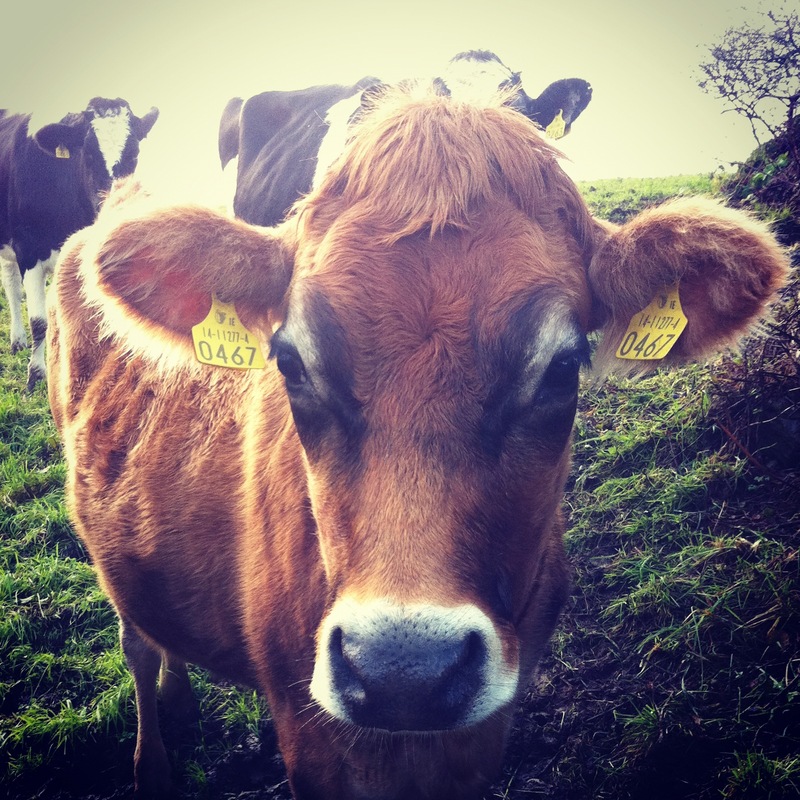 Let me give you a quick rundown of the highlights of our year living dangerously in West Cork. 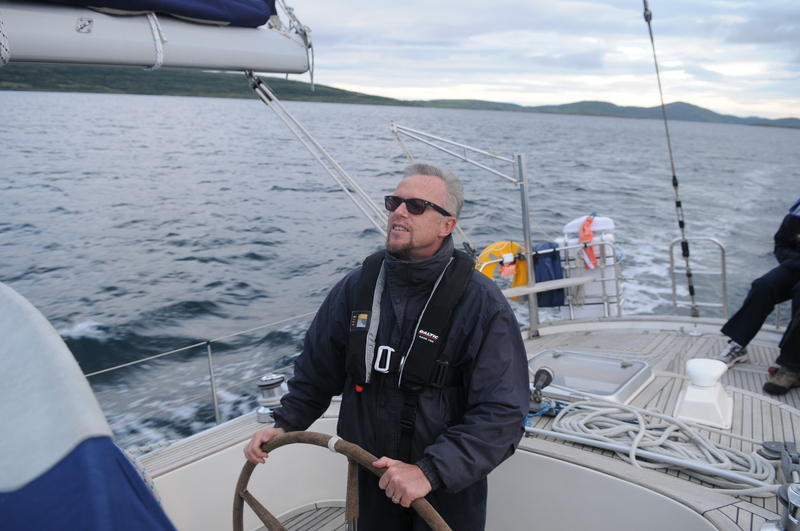 I stopped wearing suits, I grew a beard, I passed out while waiting to interview the Minister for Health, I sailed a million euro yacht in Dunmanus Bay. Life on the ocean wave. Notice the beard? Sadly no longer in place. 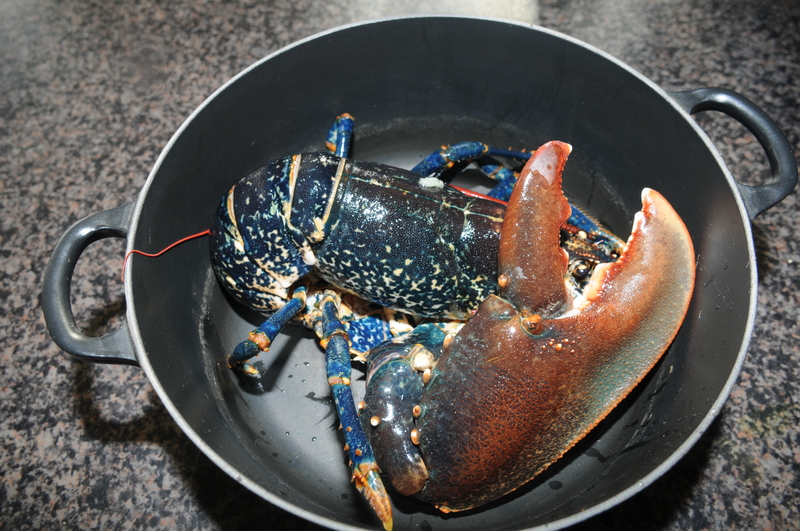 I plucked and ate pheasant, dined on lobster and scallop freshly caught from the same bay, visited a fish farm in Bantry Bay, reported on a pirate invasion and compered a food festival. 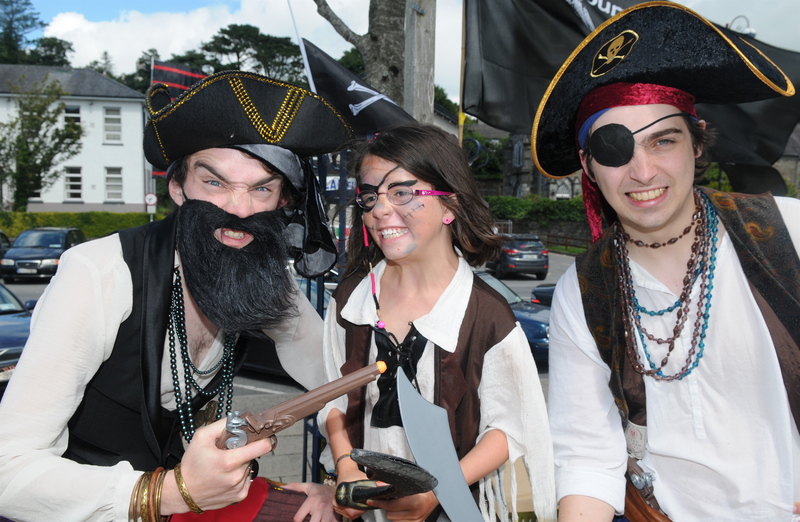 Far from the Caribbean, these are the pirates of Bantry Bay. 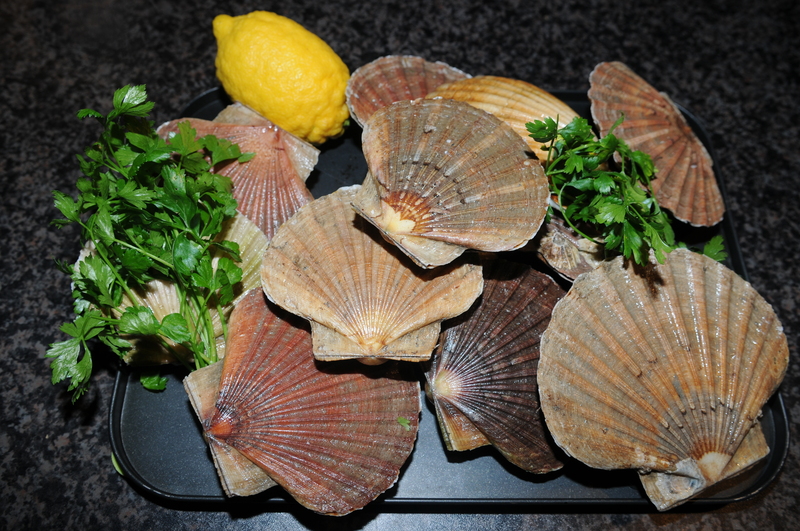 Scallops fresh from the bay. My wife started her own food business and we built our first home together, I put my back out and needed a pain relief injection while painting a skirting board. 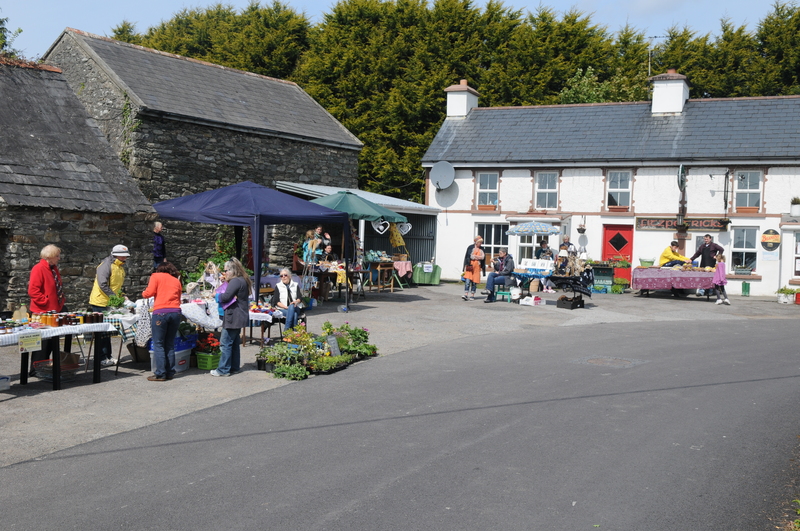 All in all, I think you’ll agree, it’s been a very productive year in West Cork. Now we are about to begin another chapter in our adventure, if I can be allowed to quote a certain political party’s slogan, ‘A lot done, more to do’. I will continue to eat the Sheep’s Head and all it has to offer but I am determined to cast my net out beyond the Peninsula and see what’s going on in Skibbereen, Schull, Ballydehob and Clonakilty. 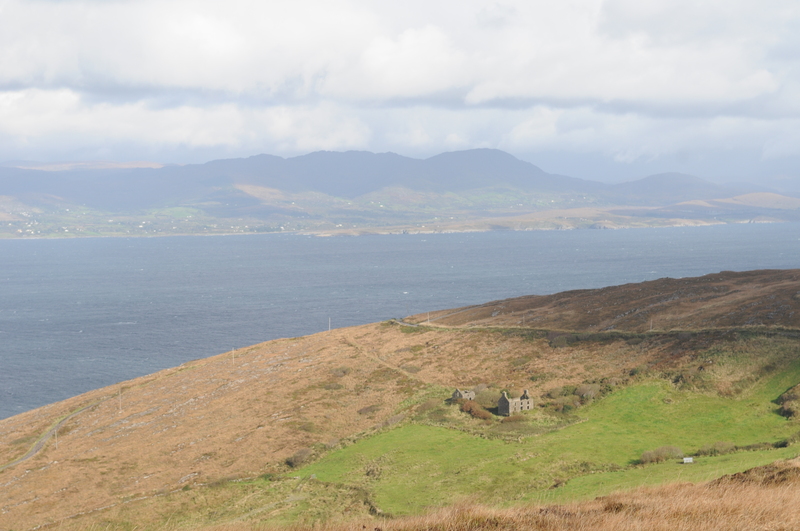 The Beara and the Mizen peninsulas are full of places to explore and good things to eat so I hope you will continue to follow Eating the Sheep’s Head as the next story unfolds. As we begin to pack up and get ready for the journey to Durrus, I want to thank everybody in Kilcrohane for all their kindness and making us feel so welcome. Even though they knew that a journalist was living in their midst, they never once threatened to run me out of the village. Believe me, this was a change from my last posting. 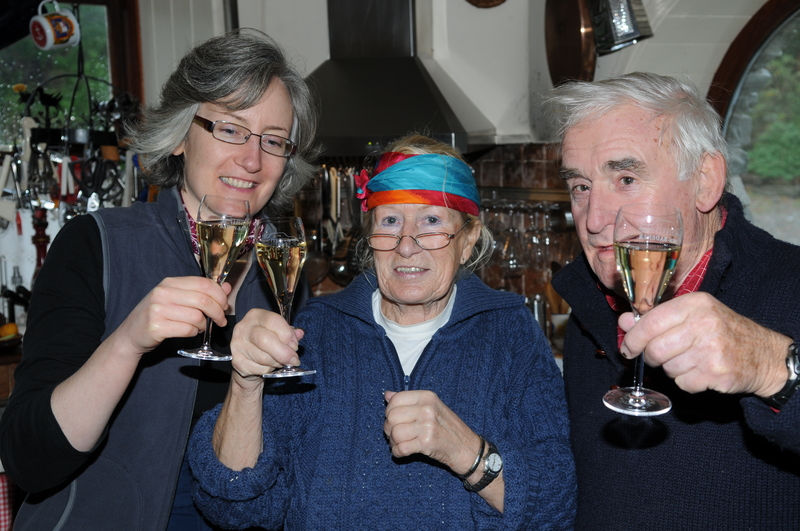 Thanks to Eileen and Mary for keeping the drinks flowing, to Elaine and Noel for the wonderful house, to Frank and Marie for providing us with not only our daily newspaper and pint of milk but also for the wonderful food and wine at the Grainstore. Thanks to Finbarr for his superb rendition of ‘Galway Girl’ played on the spoons, and to the human jukebox Neil Lynch for a New Year’s Eve to remember. Thanks also to the ‘man with the gun’ for keeping us supplied with game and seafood and of course thanks to everybody who we met and who made us feel at home. Well, that’s it, next stop Durrus. As you know I live on a peninsula: a thin sliver of land jutting out into the Atlantic ocean with Dunmanus Bay on one side and the world-famous Bantry Bay on the other. While I am, as I type, looking out at the blue-green waters of Dunmanus Bay, behind me and over the spine of the peninsula, is the much wider and much, much deeper Bantry Bay. It was here that I witnessed what can only be described as a week-long festival of every feature that makes Ireland such a great place to live. But first a bit of history for all those who are not aware of Bantry Bay’s incredible place in the nation’s story. On a cold and stormy December night in 1796, 14,000 veteran French troops huddled in the damp, dark cargo holds of 43 naval vessels. Many were sick; all of them were cold and wet after enduring a storm-filled crossing from their bases on the west coast of France. The French ships suddenly appeared out of the darkness and made their way to their target and landing point, the town of Bantry at the end of the 22-mile long bay. The French armada had successfully evaded the Royal Navy, sailed silently up Bantry Bay and were now dropping anchor over-looking the town and its sleeping inhabitants. Ireland’s back door, so to speak, was wide open. This was better than anyone had expected. The closest English garrison that could have offered some opposition was over 50 miles away in Cork city. While the French troops were eager to get ashore and begin the liberation of Ireland, there was a problem. The French fleet had broken up into smaller groups out in the Atlantic to avoid the Royal Navy and, while 43 ships had now rejoined in Bantry Bay, a few were missing. One of these missing vessels was the flagship Fraternité, and a very important passenger, the general commanding the French expedition, General Hoche. With no one to take command, no one to give the order to land and the weather getting worse by the hour, the French army waited, like sitting ducks for all to see. It must have been some sight when the sun came up and there, anchored in the bay, was this easily reached giant target. When General Hoche and the Fraternité finally arrived, he took one look at the conditions (the worsening weather and the lack of any movement by his army) and called the whole invasion off. The French hauled up their anchors and began to make their way back up the bay towards the Atlantic and home to France. Never would Ireland and the English be so unprepared for an invading army again. As the French fleet broke out into the Atlantic, a long boat known as a ‘Captains Gig’ was dislodged from one of the ships. This boat washed up on Bere Island, a small spec of land at the mouth of Bantry Bay. The Bantry Bay Longboat, as it quickly became known, was taken to Bantry House where it stayed for over 150 years until it was moved, in the 1940s, to the National Museum in Dublin. This long boat is the oldest surviving vessel in the French navy and has gone on to inspire a festival of seamanship, which involves young people from across the globe. 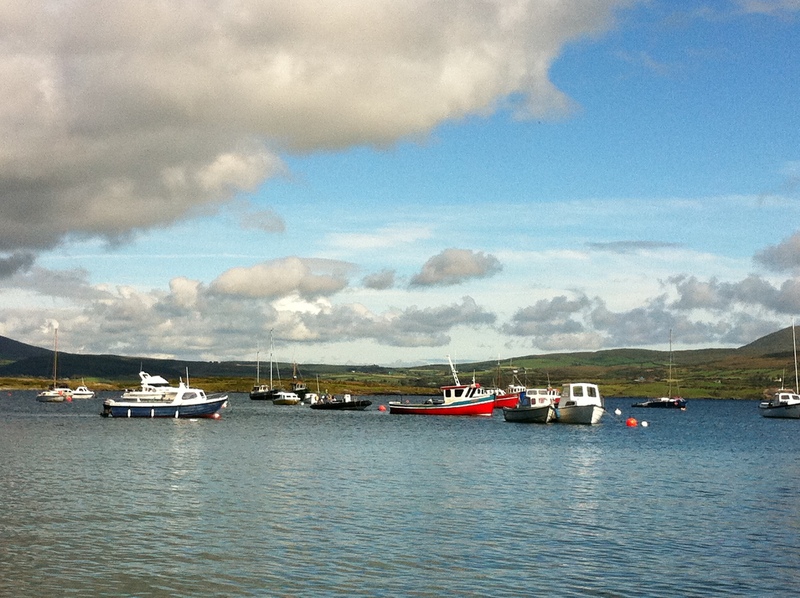 This summer, the Atlantic Challenge, as the festival is called, took place in Bantry Bay. 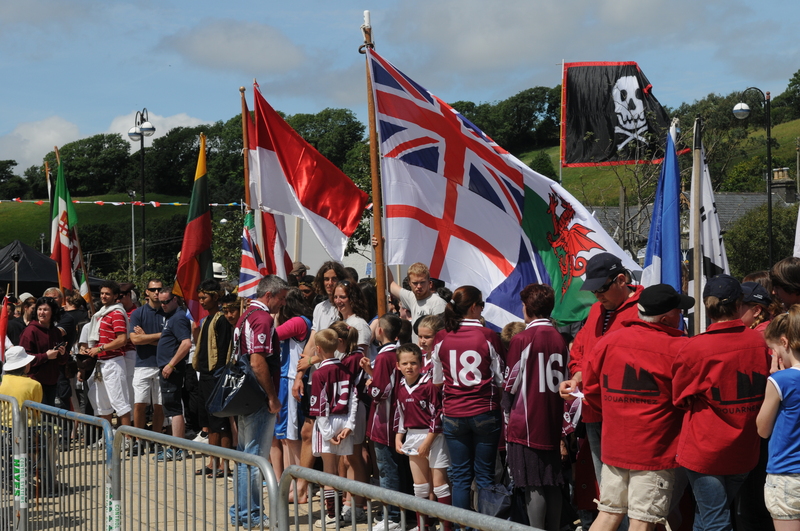 More than 300 participants representing teams from Indonesia, Canada, Russia, the USA and elsewhere spent a week in Bantry where they competed in various sea trials and generally had a whale of a time. 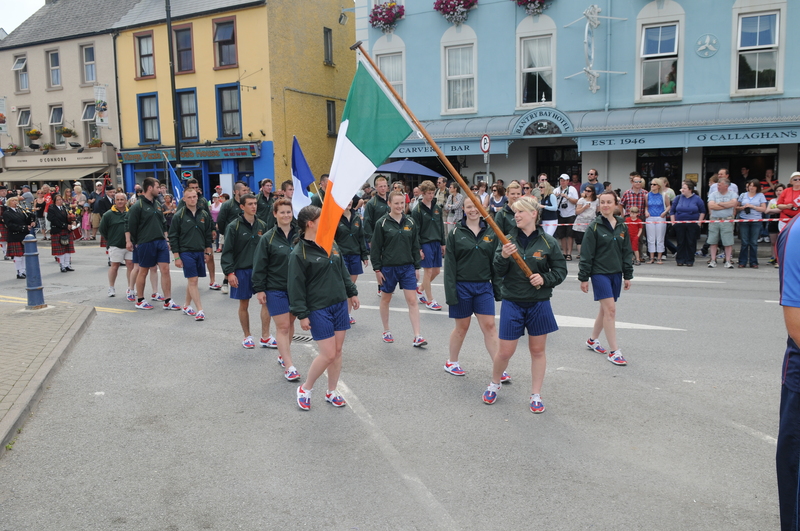 Bantry became a party town for a week; we had the President of Ireland, Michael D. Higgins, on hand to officially launch the 2012 Atlantic Challenge and there was plenty to do both on and off the water. Food, music, sailing, oh and an invasion by hundreds of pirates, all culminated in a spectacular fireworks display as Bantry said goodbye to the visitors at the end of the week. And before I continue, when I say that there were hundreds of pirates in Bantry, you must remember that the people of West Cork are no strangers to pirates. In fact the town of Baltimore (the original Baltimore in County Cork) is only too aware of what a menace ‘real’ pirates can be. More history. Back in 1631, on another dark and stormy night (we get a lot of those around here), the entire coastal town of Baltimore was sacked by pirates who took all the men, women and children to Africa where they were sold into slavery. Of the 108 people captured only three made it back to Ireland alive. 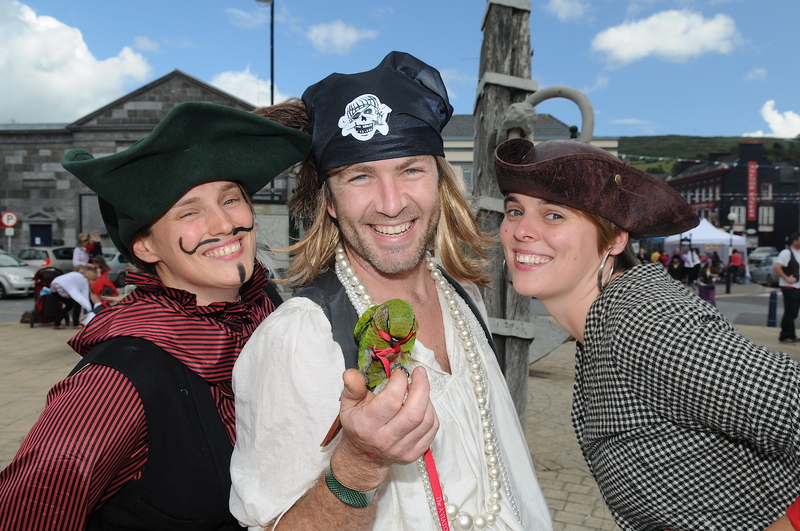 Back in Bantry, during the summer of 2012, the town was overrun with eye patches, wooden legs, muskets and even parrots, all enjoying a day-long party in the town square. However, it was far from treasure maps and plundering the high seas these lads and lasses were reared as most headed for the candyfloss and the bouncy castles. There were also prizes for the best-dressed pirates. 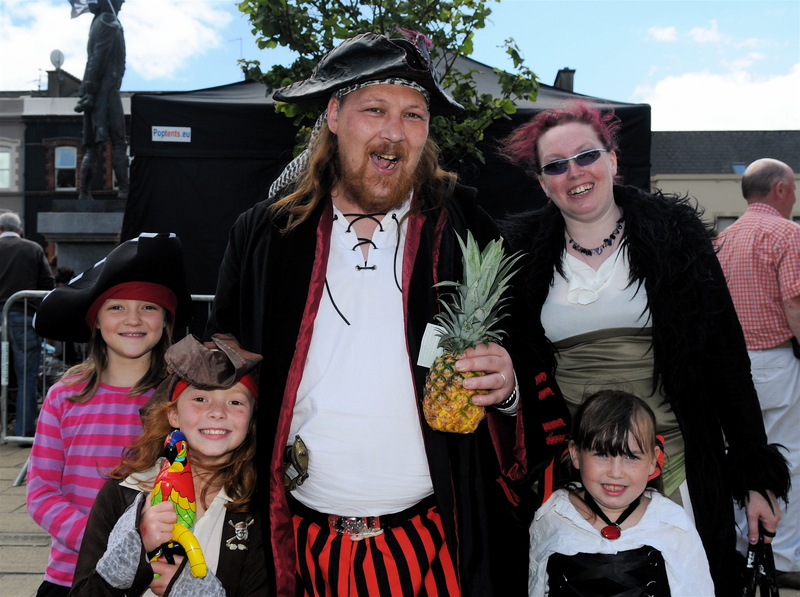 Fears that someone would be forced to walk the plank when it turned out that the prizes were pineapples and not treasure chests were short-lived but the presentation of the prickly fruits did cause one or two muskets to be drawn. As the festival came to a close, it reminded me that while I spend most of my time enjoying all that Dunmanus Bay has to offer, you can very easily miss all the other beautiful and interesting communities and locations outside of my world on the Sheep’s Head Peninsula. It’s time to get out and see more of West Cork I think.